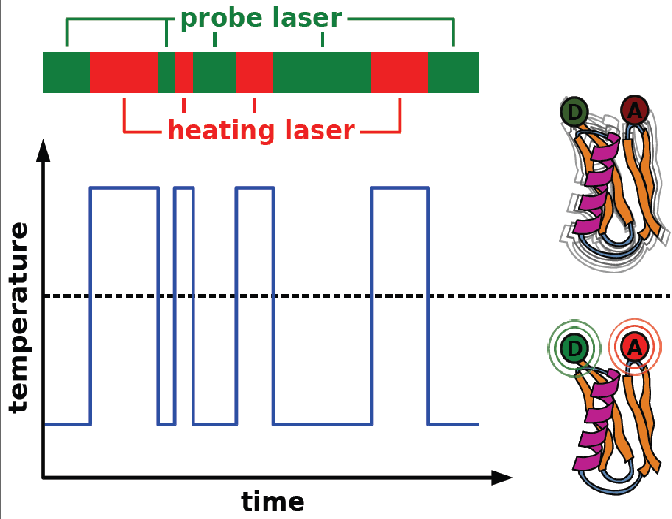 The single molecule temperature-cycle microscopy is closely related to the temperature-jump measurements on biomolecules at room temperature which is already well established. These fast temperature cycles between cryogenic temperature and room temperature can be carried out on a sample volume of approximately 1 µm in size. The sample is located inside a cryostat at low temperature. By focusing a CW near-infrared (NIR) laser beam on the surface of an absorbing metal film of the sample substrate, the focal volume can be heated up to room temperature. Once the heating beam is switched off, the heated volume temperature falls back to cryostat temperature within a few µs. By successive freeze-thaw cycles between cryogenic temperature and room temperature, the target molecule will explore different conformations, which will be mapped and studied by fluorescence resonance energy transfer (FRET). 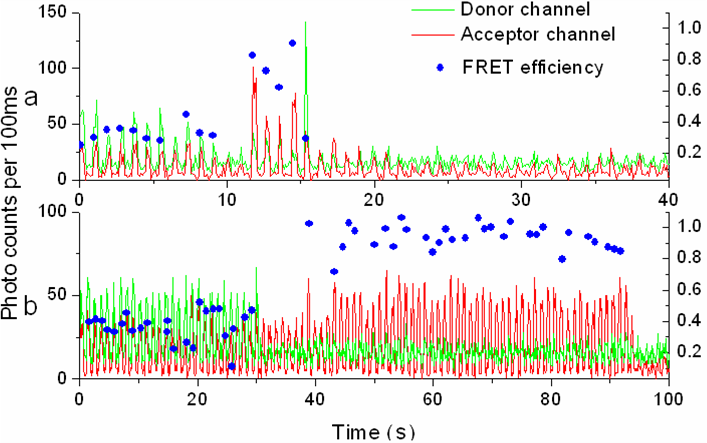 Fig.2 Two traces of temperature cycle smFRET measurements, the conformational changes induced by temperature cycles are indicated by the FRET efficiency changes. FRET efficiencies are represented using blue spots. The green curves represent the donor fluorescent signals; the red ones represent the acceptor fluorescent signals. The probe time is 300 ms (manifested as peaks in each channel), in between the single FRET coinstructs are heated up to room temperature for 10 µs.